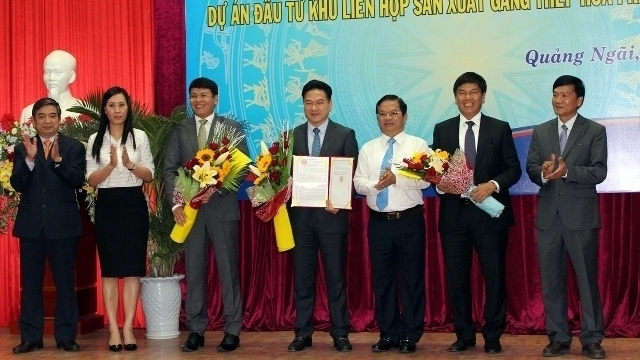 Hoa Phat Group on February 6 received an investment license for the construction of the Hoa Phat Dung Quat iron and steel production complex in the central province of Quang Ngai. Taking over the Guang Lian Dung Quat steel project, the complex is scheduled for completion within four years. It sits on a nearly 372.7ha plot, nearly 340ha of which will be earmarked for factories and around 27ha will be for specialised ports, with a total investment of VND60 trillion (US$2.6 billion). With a capacity of 4 million tonnes per year, it will mostly manufacture construction and rolled steels. In the first stage, the complex will churn out 1 million tonnes of construction steel and 1 million tonnes of rolled steel. Later, two million tonnes of rolled steel will be produced during the second stage. After being put into operation, it is expected to make an annual revenue of nearly US$2 billion, generate jobs for 8,000 workers and contribute VND4 trillion (US$173.9 million) to the State budget. Speaking at the event, Chairman of the provincial People’s Committee Tran Ngoc Cang vowed all possible support for the project. The project will be valid for 50 years and part of a master plan on steel manufacturing and distribution for 2020 approved by the Minister of Industry and Trade.